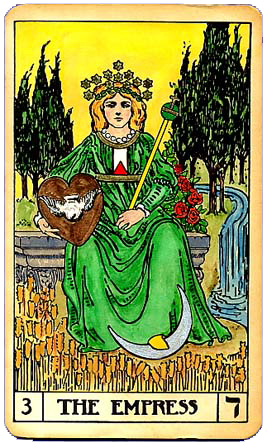 The Empress represents the Mother principle, referring to reproduction and growth; she sets all things in order. Dressed in the verdant green of nature, she is fertile and nurturing, providing the means to attract our desires. Symbolic of Venus and the material world, she rules the senses, teaching us to appreciate beauty in all forms. She is the figure of Creative Imagination, displaying the art of visualization. Confer with The Empress to increase creativity, manifest prosperity, or magnetize love. The Empress image on journals, T-shirts, and mugs. Affirm: I Am Abundantly Prospered and Cared for Now.